This purse is a great project for use with small amounts of bulky handspun yarn, or when you don't know how far your yarn will go. There really is no pattern, you just knit "until". (Until it's big enough, until you run out, until you get distracted by other projects...) Obviously it requires some ability to sew as well as knit or crochet. Make a small rectangle and fold it in half. Seam up the sides and attach a loop and button for closure. Cast "a few" stitches onto a needle sized appropriately for your yarn. You can eyeball this based on how wide you want your purse to be. I cast on 20 stitches with a US 10.5 needle. 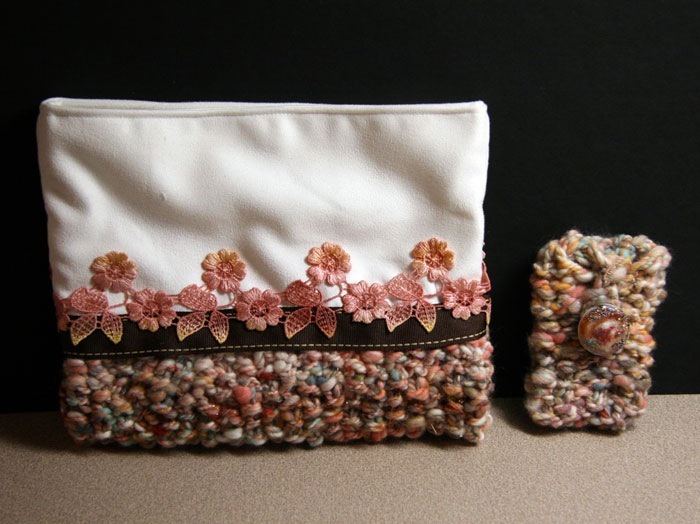 If you made the cell cozy, you can use that to measure your stitches-per-inch to accurately calculate a certain size. Knit in your chosen pattern (I used seed stitch) until you run out of yarn, or until the piece is as big as you want it. Fold the rectangle in half, seam up the sides, and voila! You have a purse bottom. Then you can cut & sew your fabric to match the size, and the bulky overlap of cloth and yarn is easily hidden with fabric glue and ribbon. Such simple ingredients, such an elegant design.